Invitation: Who Should You Vote For? Who Deserves Your Vote? Dear all candidates for Sindh Bar Council Hyderabad Division as speakers and all candidates from other districts as worthy participants, all office bearers of District Bar Associations, High Court Bar Associations, members of all Bar Association: you are cordially invited for this forum which have been organized by SINDH PROGRESSIVE LAWYERS FORUM. 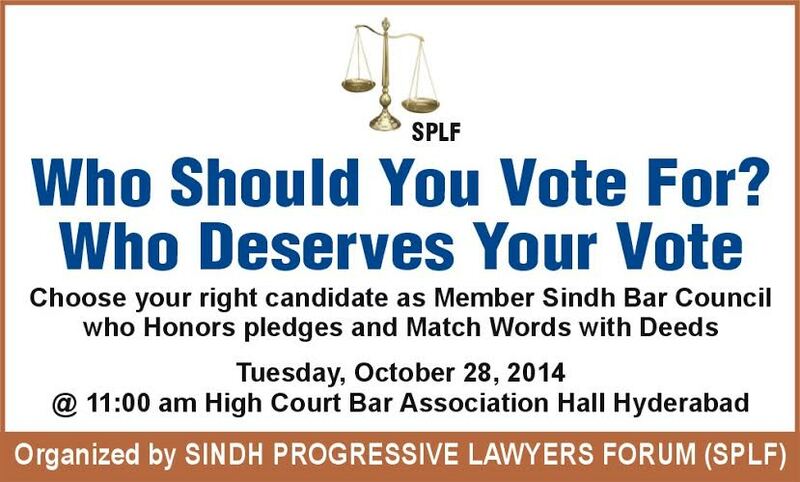 All worthy candidates who are contesting for the Sindh Bar Council seats are invited to participate and share their motto, pledges, menifestos and plans with the lawyers/their electoral and opportunity for those who have been member Sindh Bar Council to share their achievements and get appreciations from their voters. So far Election Commission has aaanounced following candidates for five seats for Hyderabad Division which includes Tando Allahyar, Tando Mohummad Khan, matiari, Badin, Thatta, Dadu districts. DISTRICTS HYDERABAD + TANDO ALLAHYAR + TANDO MUHAMMAD KHAN. DISTRICT BADIN +THATTA (1 SEAT). We have approached each candidate and invited him and her for his/her participation in the forum and we hope all candidates will join this forum and share their views. Sindh Progressive Lawyers Forum will also place stall and share development (scholarship opportunities, prospects of new law colleges and much more with the lawyers for their career and skill development). This activity is happening first time in the history of Sindh Bar Council Elections and hope you all will support us to make successful.